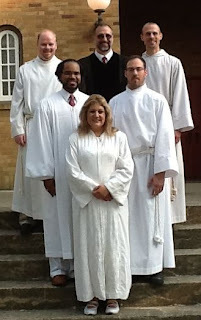 Trinity United Methodist Church of Perry Heights: So What Does “Ordination” Mean? So What Does “Ordination” Mean? Amid all the celebrating and congratulations following my ordination, the obvious question that many of you were thinking and a few asked is, “So what does this mean?” What does it mean to be ordained, or for that matter, what difference does it make? Well, it does make a difference, but many of the differences are not visible to the average person. The Book of Discipline of The United Methodist Church (Paragraph 332) says “…Elders are ordained to a lifetime of ministry of Word, Sacrament, Order, and Service. By the authority given in their ordination, they are authorized to preach and teach the Word of God, to provide pastoral care and counsel, to administer the sacraments of baptism and Holy Communion, and to order the life of the Church for service in mission and ministry.” Some would argue that these are all things that I have been doing for nine years already so nothing much has changed, and they would be right, to a point. When I was assigned to our first charge, which consisted of two churches – Johnsville Grace and Steam Corners –, I was a certified candidate for ministry. I had only taken a few seminary classes and a weekend course on how to be a pastor. I also had a piece of paper signed by the bishop that gave me permission to be the pastor of these two churches and this one local community. If I were away from there, I could not preside over communion or conduct a wedding without special permission from the bishop. Each year I had to interview with the District Board of Ordained Ministry (dCOM) and send in my piece of paper so that it could be reauthorized by the bishop for another year. Once I was a Provisional Elder, I no longer had to appear before the dCOM every year or get my paper signed, but I did have to participate in monthly group meetings with other Provisional Elders and go to a training event twice each year with all of the Provisional Elders in the East Ohio Conference. Now, as a Full Elder, my ordination is for life and is recognized worldwide. I don’t have the same sort of required meetings but I do have something else. The Book of Discipline also says that ordained elders are “bound in special covenant with all the ordained elders of the annual conference.” This means that all of us help one another and are to watch over and care for one another. It also means that we agree to subject ourselves to a process of clergy discipline. We believe that our lives should be measured by a higher standard and if we fail, it is possible to be face disciplinary action. If that happens, we are judged not by a civil court, but by our peers. Sometimes this means elders can be asked to seek counseling, sometimes it means a leave of absence, and in the worst of cases, ordination can be taken away. Curiously enough, because we agree to be subject to one another and because ordination is for life, even our retirement must be voted on by the other elders in the annual conference. By being an elder, I get a vote on some things in the workings of the church where I did not have a vote before. As a candidate for ministry and as a Provisional Elder I did not have a vote in the election of delegates, or to be a delegate to General Conference (which is held every four years) and I was not eligible to sit on certain conference committees. Because the requirements are difficult and the process somewhat arduous, there is some additional prestige in being an elder… but that was never my goal. For me being an elder is just the benchmark that I needed to reach in order to do what I believe that God called me to do. Being an elder demonstrates that my peers have recognized that I have the skills, gifts and graces that are needed to be a pastor. None of this will be obvious to the average person in the pew at Trinity United Methodist Church but it will make a difference. Having that little extra bit of prestige, that recognition from my peers, that extra ability to vote and to serve will all allow me to represent you better and to serve you better as, together, we seek ways for Trinity to be effective in ministry and in reaching out to our community. And that’s all I wanted to do all along. Even as a UMC Preacher's Kid, I didn't know much of that. But I do know why you had a black robe and the others had white! I have gotten a fair number of questions throughout the process by folks who have been in the United Methodist church for a great many years, so I knew this was a little difficult to understand. No, I don't automatically get a raise and no, this isn't the "moment" that I am allowed to begin to call myself "Reverend." As I said, the changes are mostly transparent to the the casual observer. Oh, and since Mark pointed it out, for those who didn't know, we were allowed to wear whatever robe we wanted. The black robe I was wearing was the robe my father owned when I was born so wearing it added a little extra meaning to the service.